Travelling in your own car is always more comfortable than taking a taxi. But getting behind the wheel isn’t always an exciting prospect or the right choice. Traffic stresses everyone out. We bring you DriveU. With our app, you can hire personal chauffeur and skip the hassle of getting behind the wheel. Simply call for a driver and they’ll arrive at your location promptly. They’re even equipped with seat covers and floor mats, so that the car stays clean. Our highly trained drivers have also been trained to be courteous when interacting with customers. With DriveU, you can commute in the comfort of your own car without doing any of the driving. At the price of INR 99 for the first hour, our services are easily affordable. If you happen to hire our chauffeur services for longer, you’ll only be charged for every extra minute. Our drivers are competent and can operate all kinds of personal vehicles. So whether you’re looking to travel in your sedan or your SUV, we are happy to help out. Pay ₹60 for every additional hour. Save up to 20% with hourly packages of 2, 4, 6, 8, 12 hours! City life can be exhilarating and full of opportunities. But, the crowded streets, slow-moving traffic and noise pollution can make it stressful and less desirable, particularly when you must drive your own car. With DriveU’s professional car driver service, you can now book your personal chauffeur by the day or evening and say good bye to the traffic woes. With hourly rates starting at ₹99/hour*, our professional driver service is more cost-effective than hiring a cab, since we drive your car for you. DriveU allows you to sit back and enjoy your ride as you are safely driven wherever you need to go, no matter how many stops you need to make. With our fleet of drivers spread across major cities, we ensure that the driver dressed in professional attire arrives at the pickup location at the requested time, ready to drive you to your desired destination in your own vehicle. As we take meticulous care in screening and selecting professional drivers, you can be rest assured of peace of mind and zero stress about unfamiliar locations or parking woes. Our services are designed to cater to your every need for city drives; be it your daily office commutes, business trips, running errands, airport pickup and drop, or even night drives with our special night time fares. You can also book our special outstation packages to book a driver for your weekend getaways away from the hustle and bustle of the city. We always strive to provide quality reliable service to our customers. We are currently serving in six cities. You can now find drivers in Bengaluru, Chennai, Hyderabad, Mumbai, Pune, Delhi NCR from DriveU. Initially I was a bit skeptical as calling some unknown driver might drive rudely and spoil car but reality is This is a wonderful service, I booked 45mins earlier for 4hrs package, driver was on time and very safe. App customer ppl were also v helpful. I defently recommend to friends. Have used driveu many times within the city and even outstations sometimes; Never faced any issues with their service nor their drivers till now. Their customer service is responsive and really works hard to get there. Only if they can keep up the good work. Goodluck! Great experience with Laxminarayan S from driveu, He was on time even though there was a GPS error confusion, well groomed, was very polite, was interactive and cooperative, enjoyed my ride back from office in a relaxed mode. 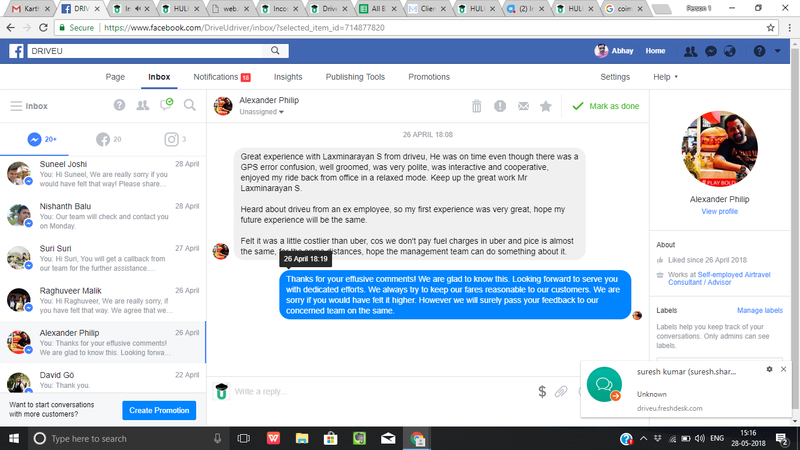 Keep up the great work Mr Laxminarayan S. Heard about driveu from an ex employee, so my first experience was very great, hope my future experience will be the same.